DOWN on the new bowling-green behind the clubhouse some sort of competition was in progress. The seats about the smooth strip of turf were crowded, and the weak-minded yapping of the patients made itself plainly audible to the Oldest Member as he sat in his favorite chair in the smoking-room. He shifted restlessly, and a frown marred the placidity of his venerable brow. To the Oldest Member a golf-club was a golf-club, and he resented the introduction of any alien element. He had opposed the institution of tennis-courts: and the suggestion of a bowling-green had stirred him to his depths. A young man in spectacles came into the smoking-room. His high forehead was aglow, and he lapped up a ginger-ale with the air of one who considers that he has earned it. “Capital exercise!” he said, beaming upon the Oldest Member. The Oldest Member laid down his “Vardon on Casual Water,” and peered suspiciously at his companion. “What did you go round in?” he asked. “A nauseous pursuit!” said the Oldest Member coldly and resumed his reading. The young man seemed nettled. The young man pondered for some moments. “But you’ve forgotten them, eh?” said the young man satirically. “No, I say!” protested the young man, looking at his watch. THIS Rollo Podmarsh (said the Oldest Member) was the only son of his mother, and she was a widow; and like other young men in that position, he had rather allowed a mother’s tender care to take the edge off what you might call his rugged manliness. Not to put too fine a point on it, he had permitted his parent to coddle him ever since he had been in the nursery; and now, in his twenty-eighth year, he invariably wore flannel next his skin, changed his shoes the moment they got wet, and—from September to May, inclusive—never went to bed without partaking of a bowl of hot arrowroot. Not, you would say, the stuff of which heroes are made. But you would be wrong. Rollo Podmarsh was a golfer, and consequently pure gold at heart: and in his hour of crisis all the good in him came to the surface. In giving you this character-sketch of Rollo, I have been at pains to make it crisp; for I observe that you are wriggling in a restless manner and you persist in pulling out that watch of yours and gazing at it. Let me tell you that if a mere skeleton outline of the man has this effect upon you, I am glad for your sake that you never met his mother. Mrs. Podmarsh could talk with enjoyment for hours on end about her son’s character and habits. And on the September evening on which I introduce her to you, though she had as a fact been speaking only for some ten minutes, it had seemed like hours to the girl Mary Kent, who was the party of the second part to the conversation. Mary Kent was the daughter of an old school-friend of Mrs. Podmarsh, and she had come to spend the autumn and winter with her while her parents were abroad. The scheme had never looked particularly good to Mary, and after ten minutes of her hostess on the subject of Rollo, she was beginning to weave dreams of knotted sheets and a swift get-away through the bedroom window in the dark of the night. “He is a strict teetotaller,” said Mrs. Podmarsh. “But here is the dear boy now,” said Mrs. Podmarsh fondly. Down the road toward them was coming a tall, well-knit figure in a Norfolk coat and gray flannel trousers. Over his broad shoulders was suspended a bag of golf-clubs. “Is that Mr. Podmarsh?” exclaimed Mary. She was surprised. After all she had been listening to about the arrowroot and the flannel next the skin and the rest of it, she had pictured the son of the house as a far weedier specimen. 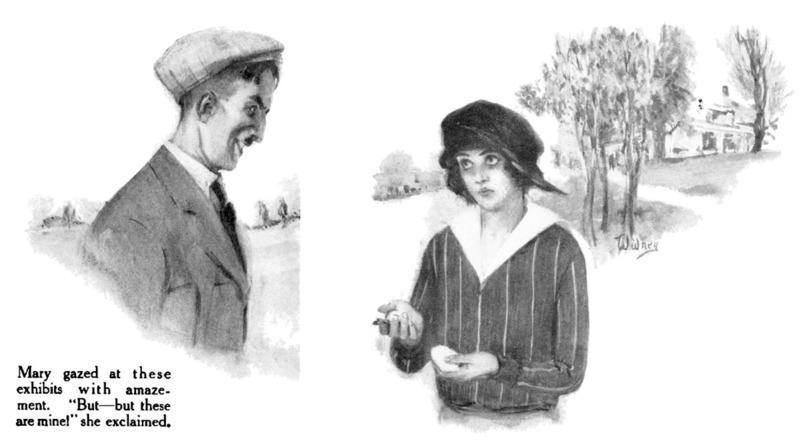 She had been expecting to meet a small, slender young man with an eyebrow mustache and pince-nez; but this person approaching might have stepped straight out of Jack Dempsey’s training-camp. “Does he play golf?” asked Mary, herself an enthusiast. Mary, who had taken a violent dislike to Rollo on the evidence of his mother’s description of his habits, had softened toward him on discovering that he was a golfer. She now reverted to her previous opinion. A man who could play the noble game from such ignoble motives was beyond the pale. Rollo Podmarsh shook hands with Mary. And at her touch the strange dizzy feeling which had come over him at the sight of her suddenly became increased a thousand-fold. As I see that you are consulting your watch once more, I will not describe his emotions as exhaustively as I might. I will merely say that he had never felt anything resembling this sensation of dazed ecstasy since the occasion when a twenty-foot putt of his, which had been going well off the line, as his putts generally did, had hit a worm-cast sou’-sou’east of the hole and popped in, giving him a snappy six. Rollo Podmarsh, as you will have divined, was in love at first sight—which makes it all the sadder to think Mary at the moment was regarding him as an outcast and a blister. A hard protuberance in his coat-pocket attracted Mrs. Podmarsh’s notice. She swooped and drew out a big-bowled pipe. And it was at these splendid words that Mary Kent felt for the first time that something might be made of Rollo Podmarsh. That she experienced one-millionth of the fervor which was gnawing at his vitals, I will not say. A woman does not fall in love in a flash like a man. But at least she no longer regarded him with loathing. On the contrary, she found herself liking him. There was, she considered, the right stuff in Rollo. And if, as seemed probable from his mother’s conversation, it would take a bit of digging to bring it up, well—she liked rescue-work and had plenty of time. Mr. Arnold Bennett in a recent essay advises young bachelors to proceed with a certain caution in matters of the heart. A young man should, he asserts, first decide whether or not he is ready for love, then whether it is better to marry earlier or later; thirdly, whether his ambitions are such that a wife will prove a hindrance to his career. These romantic preliminaries concluded, he may grab a girl and go to it. Rollo Podmarsh would have made a tough audience for these precepts. Since the days of Antony and Cleopatra, probably no one had ever got more swiftly off the mark. One may say that he was in love before he had come within two yards of the girl. And each day that passed found him more nearly up to his eyebrows in the tender emotion. He thought of Mary when he was changing his wet shoes; he dreamed of her while putting flannel next his skin; he yearned for her over the evening arrowroot. Why, the man was such a slave to his devotion that he actually went to the length of purloining small articles belonging to her. Two days after Mary’s arrival Rollo Podmarsh was driving off the first tee with one of her handkerchiefs, a powder-puff and a dozen hairpins secreted in his left breast-pocket. When dressing for dinner, he used to take them out and look at them, and at night he slept with them under his pillow. Heavens, how he loved that girl! One evening, when they had gone out into the garden together to look at the new moon,—Rollo, by his mother’s advice, wearing a woolen scarf to protect his throat,—he endeavored to bring the conversation round to the important subject. Mary’s last remark had been about earwigs. Considered as a cue, it lacked a subtle something; but Rollo was not the man to be discouraged by that. Mary was silent for a moment before replying. “A hero,” said Mary promptly. We have now, therefore, arrived at a period in Rollo Podmarsh’s career which might have inspired those lines of Henley’s about “the night that covers me, black as the pit from pole to pole.” What with one thing and another, he was in an almost Job-like condition of despondency. I say “one thing and another,” for it was not only hopeless love that weighed him down. In addition to being hopelessly in love, he was greatly depressed about his golf. On Rollo in his capacity of golfer, I have so far not dwelt. You have probably allowed yourself, in spite of the significant episode of the pipe, to dismiss him as one of those placid, contented, shall I say dilettanti, golfers who are so frequent in these degenerate days. Such was not the case. Outwardly placid, Rollo was consumed inwardly by an ever-burning fever of ambition. His aims were not extravagant. He did not want to become amateur champion, nor even to win a monthly medal; but he did with his whole soul desire one of these days to go round the course in under a hundred. This feat accomplished, it was his intention to set the seal on his golfing career by playing a real money-match; and already he had selected his opponent, a certain Colonel Bodger, a tottery performer of advanced years who for the last decade had been a martyr to lumbago. But it began to look as if even the modest goal he had marked out for himself were beyond his powers. Day after day he would step onto the first tee, glowing with zeal and hope, only to crawl home in the quiet evenfall with another hundred and twenty on his card. He was one of those golfers who never seem to have what you might call a full hand. If he was on his drive, he was off his putting; every time he struck a good vein of putting, something was bound to go wrong with his iron-shots; and on the rare occasion when it seemed as though he was at the top of his form in all branches of the game, a half-gale was sure to spring up, and that dished him absolutely every time. Little wonder, then, that he began to lose his appetite and would moan feebly at the sight of a poached egg. With Mrs. Podmarsh sedulously watching over her son’s health, you might have supposed that this inability on his part to teach the foodstuffs to take a joke would have caused consternation in the home. But it so happened that Rollo’s mother had recently been reading a medical treatise in which an eminent physician stated that we all eat too much nowadays, and that the secret of a happy life is to lay off the carbohydrates to some extent. She was, therefore, delighted to observe the young man’s moderation in the matter of food, and frequently held him up as an example to be noted and followed by little Lettice Willoughby, her granddaughter, who was a good and consistent trencherwoman, particularly rough on the puddings. Little Lettice, I should mention, was the daughter of Rollo’s sister Enid, who lived in the neighborhood. 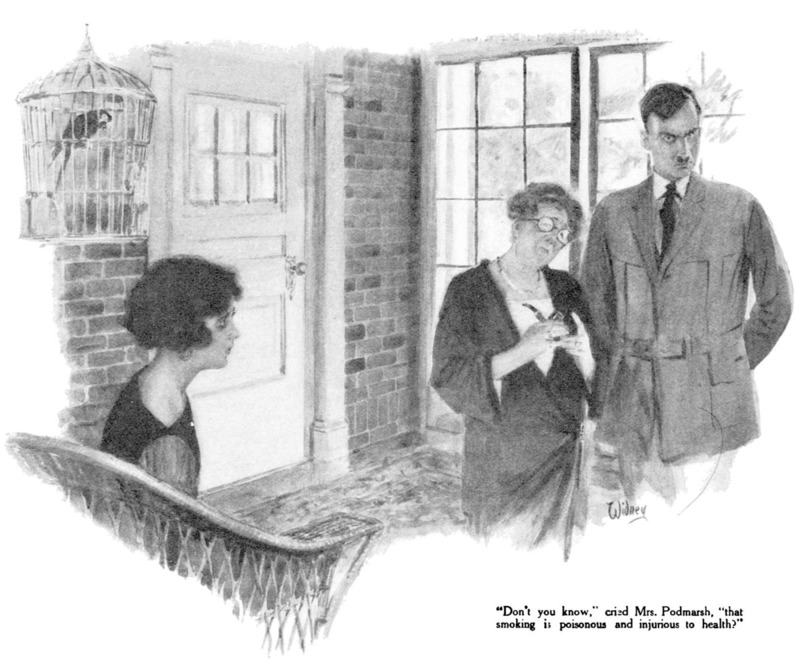 Mrs. Willoughby had been compelled to go away on a visit a few days before, and had left her child with Mrs. Podmarsh during her absence. You can fool some of the people all the time, but Lettice Willoughby was not of the type that is easily deceived. A nice, old-fashioned child would no doubt have accepted without questioning her grandmother’s dictum that roly-poly pudding could not fail to hand a devastating wallop to the blood-pressure, and that to take two helpings of it was practically equivalent to walking right into the family vault. 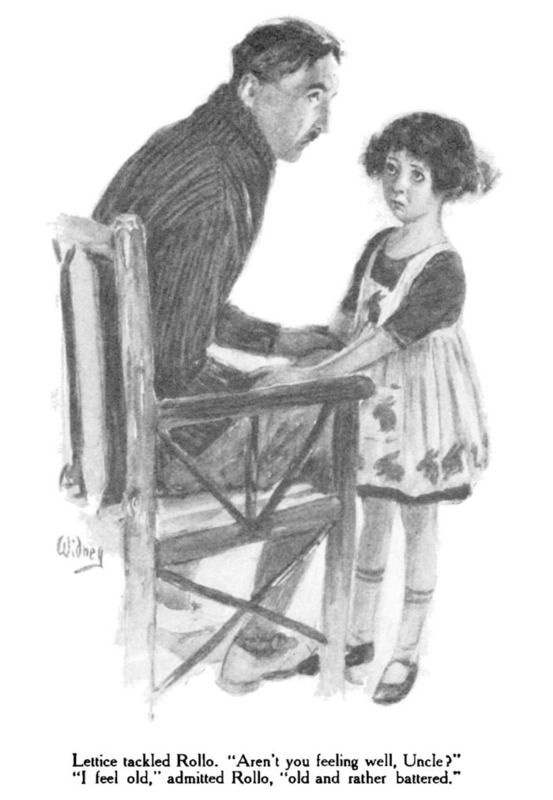 A child with less decided opinions of her own would have been impressed by the spectacle of her uncle refusing sustenance, and would have received without demur the statement that he did it because he felt that abstinence was good for his health. Lettice was a modern child and knew better. She had had experience of this loss of appetite and its significance. The first symptom which had preceded the demise of poor old Ponto, who had recently handed in his portfolio after holding office for ten years as the Willoughby family dog, had been this same disinclination to absorb nourishment. Besides, she was an observant child, and had not failed to note the haggard misery in her uncle’s eyes. Lettice tackled Rollo squarely on the subject one morning after breakfast. He had retired into the more distant parts of the garden, and was leaning forward, when she found him, with his head buried in his hands. “Ah, child!” he said. He was fond of his niece. “It’s old age, I expect,” said Lettice. Lettice could not quite understand what Uncle Rollo was talking about, but she gathered broadly that she had been correct in supposing him to be in a bad state, and her warm, childish heart was filled with pity for him. She walked thoughtfully away, and Rollo resumed his revery. Into each life, as the poet says, some rain must fall. So much had recently been falling into Rollo’s that when Fortune at last sent along a belated sunbeam, it exercised a cheering effect out of all proportion to its size. By this I mean that when, some four days after his conversation with Lettice, Mary Kent asked him to play golf with her, he read into the invitation a significance which only a lover could have seen in it. I will not go so far as to say that Rollo Podmarsh looked on Mary Kent’s suggestion that they should have a round together as actually tantamount to a revelation of undying love, but he certainly regarded it as a most encouraging sign. It seemed to him that things were beginning to move, that Rollo Preferred was on a rising market. Gone was the gloom of the past days. He forgot those sad solitary wanderings of his in the bushes at the bottom of the garden; he forgot that his mother had bought him a new set of winter woolies which felt like horsehair; he forgot that for the last few evenings his arrowroot had tasted rummy. His whole mind was occupied with the astounding fact that she had voluntarily offered to play golf with him, and he walked out on to the first tee filled with a yeasty exhilaration which nearly caused him to burst into song. Rollo was under the disadvantage of not actually possessing a handicap. He had a sort of private system of bookkeeping of his own by which he took strokes over, if they did not seem to him to be up to sample, and allowed himself five-foot putts at discretion. So he had never actually handed in the three cards necessary for handicapping purposes. She drove off one of those fair-to-medium balls which go with a twelve handicap—not a great length, but nice and straight. Titanic emotions were surging in Rollo’s bosom as he addressed his ball. He had never felt like this before, especially on the first tee—where as a rule he found himself overcome with a nervous humility. “Oh, Mary—Mary!” he breathed to himself as he swung. You, who squander your golden youth fooling about on a bowling-green, will not understand the magic of those three words. But if you were a golfer, you would realize that in selecting just that invocation to breathe to himself, Rollo Podmarsh had hit by sheer accident on the ideal method of achieving a fine drive. Let me explain. The first two words, tensely breathed, are just sufficient to take a man with the proper slowness to the top of his swing; the first syllable of the second “Mary” exactly coincides with the striking of the ball; and the final “-ry!” takes care of the following-through. The consequence was that Rollo’s ball, instead of hopping down the hill like an embarrassed duck, as was its usual practice, sang off the tee with a scream like a shell, nodded in passing to Mary’s ball, where it lay some hundred and fifty yards down the course, and carrying on from there, came to rest within easy distance of the green. For the first time in his golfing life, Rollo Podmarsh had hit a nifty. Mary followed the ball’s flight with astonished eyes. Rollo shut his eyes, and his lips moved feverishly. He was registering a vow that, come what might, he would not fail her. A minute later he was holing out in three, one under bogey. The second hole is the short lake-hole. Bogey is three, and Rollo generally did it in four; for it was his custom not to count any balls he might sink in the water, but to start afresh with the one which happened to get over and then take three putts. But today something seemed to tell him that he would not require the aid of this ingenious system. As he took his mashie from the bag, he knew that his first shot would soar successfully on to the green. “Ah, Mary!” he breathed as he swung. These subtleties are wasted on a worm, if you will pardon the expression, like yourself, who possibly owing to a defective education is content to spend life’s springtime rolling wooden balls across a lawn; but I will explain that in altering and shortening his soliloquy at this juncture, Rollo had done the very thing any good pro would have recommended. If he had murmured, “Oh, Mary! Mary!” as before, he would have over-swung. “Ah, Mary!” was exactly right for a half-swing with the mashie. His ball shot up in a beautiful arc and trickled to within six inches of the hole. Mary was delighted. There was something about this big, diffident man which had appealed from the first to everything in her that was motherly. And, not to weary you with too much detail, I will simply remark that, stimulated by her gentle encouragement, Rollo Podmarsh actually came off the ninth green with a medal score of forty-six for the half-round. A ten on the seventh had spoiled his card to some extent, and a nine on the eighth had not helped; but nevertheless here he was in forty-six, with the easier half of the course before him. He tingled all over—partly because he was wearing the new winter woolies to which I have alluded previously, but principally owing to triumph, elation and love. He gazed at Mary as Dante might have gazed at Beatrice on one of his particularly sentimental mornings. Rollo proceeded over the brow of the hill to the tenth tee, and was filling in the time with practice-swings when he heard his name spoken. He turned, to see his sister, Mrs. Willoughby, the mother of the child Lettice. His voice trailed off into a broken gurgle. Quite suddenly a sinister thought had come to him. The arrowroot had tasted rummy! 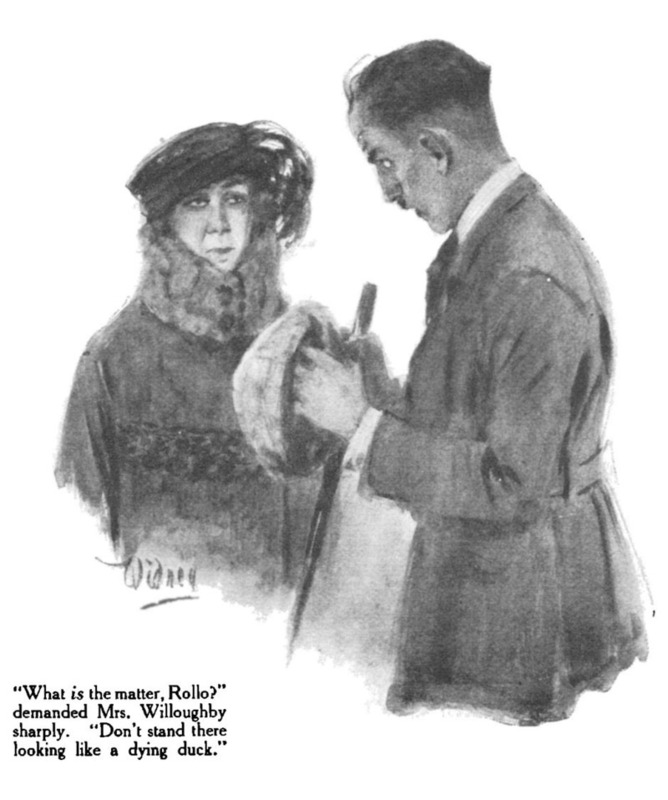 “Why, what on earth is the matter?” asked Mrs. Willoughby, regarding his ashen face. Rollo could find no words. He yammered speechlessly. Yes, for several nights the arrowroot had tasted very rummy. Rummy! There was no other adjective. Even as he plied the spoon, he had said to himself: “This arrowroot tastes rummy!” And he uttered a sharp yelp as he remembered—it had been little Lettice who had brought it to him! He recollected being touched at the time by the kindly act. “Don’t be ridiculous! And kindly don’t speak of her like that!” Mrs. Willoughby reproved him. Mrs. Willoughby uttered an impatient exclamation and walked away. ROLLO PODMARSH stood on the tenth tee, a volcano of mixed emotions. Mechanically he pulled out his pipe and lit it. But he found that he could not smoke. In this supreme crisis of his life, tobacco seemed to have lost its magic. He put the pipe back in his pocket and gave himself up to his thoughts. Now terror gripped him—anon a sort of gentle melancholy. It was so hard that he should be compelled to leave the world just as he had begun to hit ’em right. And then in the welter of his thoughts there came one of practical value—to wit, that by hurrying to the doctor’s without delay, he might yet be saved. There might be antidotes. He turned to go—and there was Mary Kent standing beside him with her bright, encouraging smile. Rollo’s thoughts flitted wistfully to the snug surgery where Doctor Brown was probably sitting at this moment surrounded by the finest antidotes. For one long moment Rollo continued to hesitate—a moment during which the instinct of self-preservation seemed as if it must win the day. All his life he had been brought up to be nervous about his health, and panic gripped him. But there is a deeper, nobler instinct than that of self-preservation, the instinctive desire of a golfer who is at the top of his form, to go on and beat his medal-score record. And little by little this grand impulse began to dominate Rollo. If, he felt, he went off now to take antidotes, the doctor might possibly save his life; but reason told him that never again would he be likely to do the first nine in forty-six. He would have to start all over afresh. Rollo Podmarsh hesitated no longer. With a pale, set face, he teed up his ball and drove. IF I were telling this story to a golfer instead of to an excrescence—I use the word in the kindliest spirit—who spends his time messing about on a bowling-green, nothing would please me better than to describe shot by shot Rollo’s progress over the remaining nine holes. Epics have been written with less material. I would speak of his iron-shot on the dog-leg hole, the masterful plonk with the brassie which put him pin-high on the twelfth, his approach-putt on the fifteenth. But these details would, I am aware, be wasted on you. Let it suffice that by the time his last approach trickled onto the eighteenth green, he had taken exactly fifty shots. It was prudent counsel, but Rollo was now thoroughly above himself. He had got his feet wet in a puddle on the sixteenth, but he did not care. His winter woolies seemed to be lined with ants, but he ignored them. All he knew was that he was on the last green in ninety-six, and he meant to finish in style. No tame three putts for him. His ball was five yards away, but he aimed for the back of the hole and brought his putter down with a whack. Straight and true the ball sped, hit the dish, jumped high in the air, and fell into the hole with a rattle. Rollo Podmarsh wiped his forehead and leaned dizzily on his putter. For a moment, so intense is the fervor induced by the game of games, all he could think of was that he had gone round in ninety-seven. Then, as one waking from a trance, he began to appreciate his position. The fever passed, and a clammy dismay took possession of him. He had achieved his life’s ambition, but what now? Already he was conscious of a curious discomfort within him. He felt as he supposed Italians of the Middle Ages must have felt after dropping in to take pot-luck with the Borgias. It was hard. He had gone round in ninety-seven, but he could never take the next step in the career which he had mapped out in his dreams—the money-match with the lumbago-stricken Colonel Bodger. Mary Kent was fluttering round him, bubbling congratulations, but Rollo sighed. Rollo explained. Mary listened pallidly. “Are you sure?” she gasped. “Permit me,” said Rollo, producing one of her best from his left breast-pocket. “I wish I had a powder-puff,” said Mary. “Allow me,” said Rollo. “And your hair has become a little disordered. If I may—” And from the same reservoir he drew a handful of hairpins. Mary gazed at these exhibits with amazement. “But—but these are mine!” she said. “Because I loved you,” said Rollo. And in a few moving sentences which I will not trouble you with, he went on to elaborate this theme. Mary listened with her heart full of surging emotions which I cannot possibly go into if you persist in looking at that damned watch of yours. The scales had fallen from her eyes. She had thought slightingly of this man because he had been a little overcareful of his health; and all the time he had had within him the potentiality of heroism! Something seemed to snap inside her. “Rollo!” she cried, and flung herself into his arms. “Mary!” muttered Rollo, gathering her up. Rollo disentangled himself from Mary. Mrs. Willoughby repeated her remarks. There was a long silence. To Rollo Podmarsh it seemed as though the sun had suddenly begun to shine, the birds to sing, and the grasshoppers to toot. All Nature was one vast substantial smile. Down in the valley by the second hole he caught sight of Wallace Chesney’s plus fours gleaming as their owner stooped to play his shot, and it seemed to him that he had never in his life seen anything so lovely. Rollo kissed her, and with long, resolute steps strode to the clubhouse. This is the second-printed version of this story; it appeared in the UK Strand magazine in January 1923 under the title “The Awakening of Rollo Podmarsh.” The Strand version was collected in The Heart of a Goof (1926) [U.S. edition published as Divots (1927)] and in later anthologies including Fore! and the Golf Omnibus. In “The second hole” paragraph, magazine had “successfuly” in last sentence. In third-to-last paragraph, magazine had a period rather than a comma after “clubhouse furnace,” “Colonel Bodgers” insted of “Bodger,” and “canbreak” as one word. 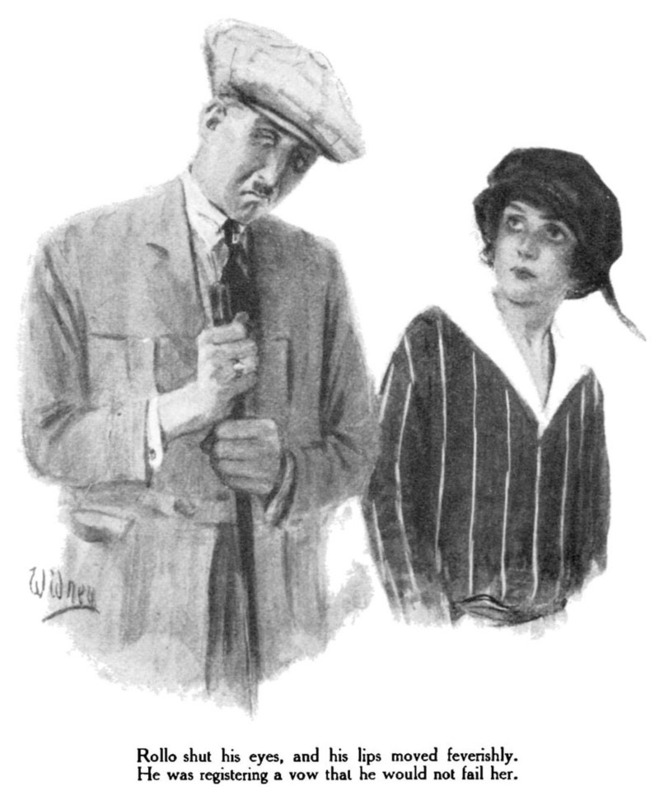 Many details of the game of golf, especially as applied to Wodehouse’s era, are explained in A Glossary of Golf Terminology on this site. A few terms specific to the current story are annotated below. Vardon on Casual Water: This book seems to be Wodehouse’s invention, but Harry Vardon (1870–1937), six-time [British] Open Champion and also winner of the U. S. Open in 1900, did write at least seven books on golf. “Casual water” is a temporary accumulation of water on the course, not part of a deliberate water hazard, for instance a puddle left by a rain shower; if one’s ball rests in such water or it interferes with one’s stance, the ball may be moved from the casual water without penalty under very specific rules, e.g. USGA Rule 25-1b. arrowroot: A food starch refined from the roots of several tropical plants, valued by the Victorians as an easily digestible food for children and invalids, although it provides little nutrition other than complex carbohydrate calories. It can be baked into biscuits, boiled as puddings, and used as a thickener for jellies, gravies, and clear sauces. Ted Ray: British professional golfer (1877–1943), like Harry Vardon a native of Jersey in the Channel Islands; won the [British] Open in 1912 and the U. S. Open in 1920. Arnold Bennett, in a recent essay: This may be a reference to “Marriage” in Mental Efficiency, and Other Hints to Men and Women (1911), or to another essay not yet found. This one at least states that “the attitude towards marriage of the heart-free bachelor must be at best a highly cautious attitude” but does not explicitly include the items in Wodehouse’s summary of them. Arnold Bennett (1867–1931) was a British writer best known for his novels, but who also wrote plays, essays, and journalism. A young man should, he asserts: In the Strand version of the story, this passage is addressed to young bachelors in the plural: “They should…they are…their” rather than “he is” and “his.” British and American book texts follow Strand. one grand sweet song: from a poem variously titled “A Farewell” and “One Grand Sweet Song” by Charles Kingsley (1819–1875). 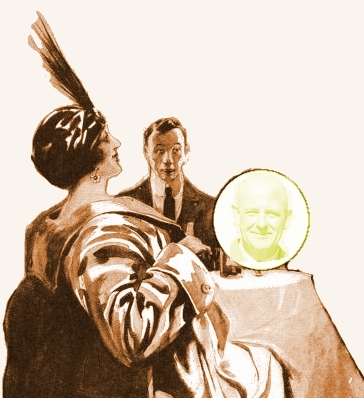 Wodehouse alludes to it often, especially in “Keeping It from Harold” where the title character is memorizing the poem. He was one of those golfers…: This sentence and the next are present only in the Red Book version of this story. particularly rough on the puddings: American readers should be reminded that “pudding” in British terminology can mean any sort of sweet dessert course, not merely the thick creamy sweet mixtures that go by that name in America, nor even the heavier sweetened-grain-and-fruit recipes such as rice pudding, bread pudding, or plum pudding. Ponto: A favorite name for a dog in Victorian and Edwardian Britain; Margaret Goodwin in Not George Washington, Uncle James in “The Sluggard”, and Angela Purdue in “A Slice of Life” had dogs of this name; another Ponto is remembered as “Ever a Faithful Friend” on a grave marker at Shipley Hall in Money in the Bank. Into each life, as the poet says, some rain must fall: Henry Wadsworth Longfellow, “The Rainy Day” from Ballads and Other Poems (1842). Rollo Preferred was on a rising market: comparing Rollo’s fluctuating romantic chances to a stock quotation of preferred shares of a corporation. The same analogy informed the US title of Fish Preferred, better known under its UK title of Summer Lightning. bogey: In British terms, the number of strokes that a good golfer would be expected to take on a given hole; from the Scots bogey for a ghost or wraith. A solo golfer may play “against bogey”—in other words, comparing his score against that mythical standard player rather than a live human opponent. The fictional opponent was given the rank of “Colonel Bogey” in British military golfing circles. “I’ll give you this”: Only in match play can a player concede a hole, since the game is scored in holes won and lost. There is no need for the player who must inevitably take more strokes on that hole actually to hole out, as the total number of strokes is not added up as in medal play—unless, as Rollo is doing here, he is also keeping a medal score to see if he can break a hundred for the round. I would speak of his iron-shot…: This sentence is omitted in all other versions. chemist: typically British terminology for a druggist or pharmacist (in US terms). Wallace Chesney’s Plus Fours: golf knickerbockers which buckle four inches below the knee; see “The Plus Fours” for the story of this special garment. fifty cents a hole: “a shilling a hole” in all other versions of this story.